iFLY – Roseville, CA – Awesome Indoor Skydiving!! For Roxy’s 5th birthday we took her to indoor skydiving at iFly in Roseville and invited along some friends. 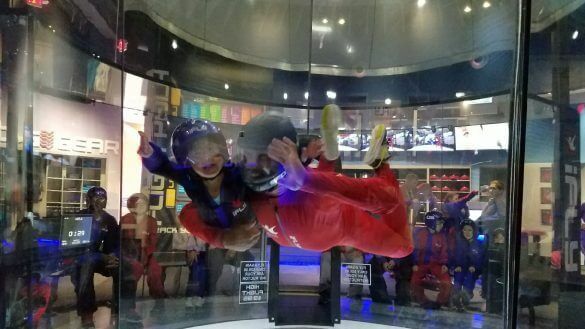 For those of you who have never heard about it, indoor skydiving is the simulation of true freefall conditions in a vertical wind tunnel. I am happy to say that iFly lived up to the hype and we’ve already bought a package to return. When we first got there they had us check-in. Every package includes a Pre-Flight Training and dressing up in a flight suit, a helmet, goggles, and ear plugs for your flight. I was wearing boots when I arrived so they gave me a pair of shoes to wear. Each flight is a minute but you can add on extra minutes. We went for the Top Flight package which included an extra minute of flying time, a pic, and video for each person. They answered all our questions, and escorted us to a room for pre-flight training. We watched a short video where we learned about indoor skydiving and the signals for “straight legs,” bend legs,” “chin up,” and “relax.” Our instructor Scott was very knowledgeable and carefully answered all our questions. We then suited up and headed into the chamber inside. The actual experience of indoor flying is really awesome. Kenny, Roxy, and I and our friends each had 2 flights that were a minute and a half each. It’s actually a lot more physically demanding than I expected. The instructor will stay with you to make sure that you are safe and have a good experience. You have to try to lay somewhat flat with your hands next to your head and your knees slightly bent. You also have a ton of wind pressure coming at you. It’s definitely not for the feint of heart, pregnant women, or anybody with any sort of physical impairment, disability or pain, or anybody with a heart condition. The instructor will grab you if you’re about to go flying in the wrong direction. Roxy went first like the fearless champ she is. She was very small and seemed to have a great time flying around inside the tube. When I went, I was actually pretty apprehensive, and they kept signaling me to relax. I felt like I was inside a tornado or something. But I loved spinning around the tube. We purchased the “high fly” for our 2nd flight. For the “high fly” option the instructor holds onto you and tries to make you go as high as possible. They also do tricks with you to enhance your experience. As you can see from the pics and videos, we had a blast!! Roxy really had an awesome birthday at iFly. I really feel like we were taken care of. Scott, our instructor, was great. He was knowledgeable, friendly, and really made sure that we had an excellent experience. Kenny and I already bought several discounted packages (offered to us at the end of our flights) so that we can go back. 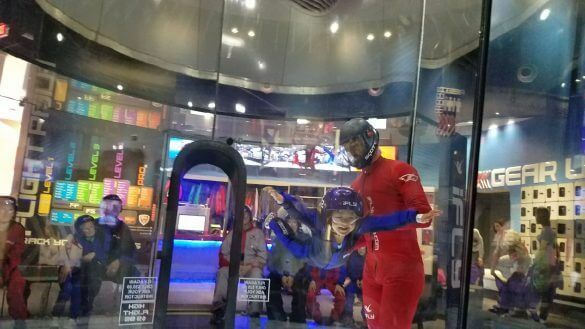 Indoor skydiving is pricey but I honestly count my money well spent. I highly recommend iFly to anybody who wants to experience something different and out of the ordinary. It would be great for a family or couples outing, hanging out with friends, or a birthday party or special occasion. 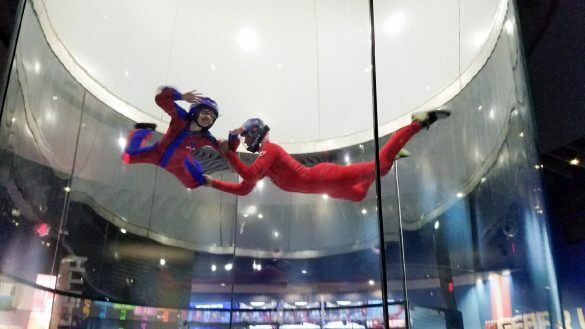 The customer service is exceptional and the indoor skydiving experience at iFly is out of this world. Jax approved!